Deborah A. Brobst, 59 years, of Allentown, passed away Saturday, April 6th at Lehigh Valley Hospice, Cedar Crest. Born in Allentown, she was the daughter of the late William R. Brobst and Trudy Brobst, companion of Jack Myers. Deb was employed at the former Qualex for many years. She was a member of St. Matthew’s Lutheran Church in Allentown. 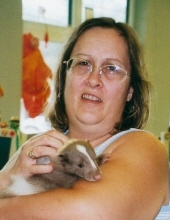 She was very involved in animal rescue and rehabilitation, volunteering with Wildlands Conservancy, Itty Bitty Kitty, and Pelican Man in Sarasota, FL. Surviving with her mother is a son Richard C. Kline III, brothers Scott and his wife Susan and William R. Jr. and his wife Angela, sister Jennifer, wife of Charles Riddick, grandchildren Caroline, Christian, and Rachel, nephew and niece Scott Jr. and Ashley, and her beloved dog Niko. She was predeceased by her father and a nephew William R. Brobst III. A memorial service will be announced at a later date at www.brubakerfuneralhome.com, where online condolences may also be made to the family. Brubaker Funeral Home Inc. 327 Chestnut St. Coplay, PA 18037 is handling arrangements. Memorial donations may be made to Pocono Wildlife Rehabilitation & Education Center 1161 Cherry Dr. Stroudsburg, PA 18360. To plant a tree in memory of Deborah A. Brobst, please visit our Tribute Store. "Email Address" would like to share the life celebration of Deborah A. Brobst. Click on the "link" to go to share a favorite memory or leave a condolence message for the family.